What led to the FSM? The "United Front" becomes the "Free Speech Movement"
Mario Savio: I had the feeling that “FSM” was suggested by Jack. There were a lot of possibilities. But we wanted the initials to be something like “fln” which was easy to say. Not something like “urm,” which sounded kind of “earthy.” “University Rights Movement” was OK, but not “urm.” It’s a great name, but there’s a certain kind of humor floating around in “urm” that isn’t appropriate to the Free Speech Movement. Bob Starobin: The name “FSM” was proposed by Jack Weinberg. 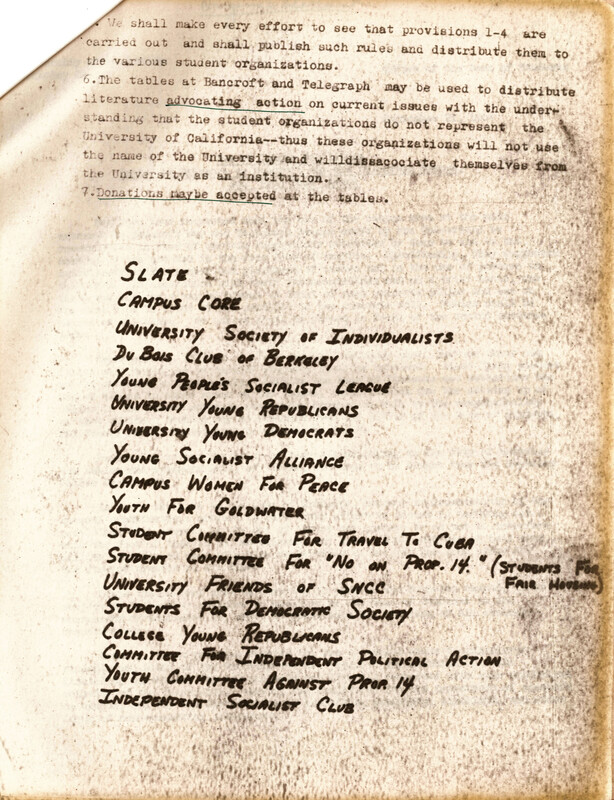 Another name was “Students for Civil Liberties.” I favored Jack’s suggestion because it was something that could be written on the walls, like in Paris or Algiers. The name was adopted by a margin of one vote. The mood of this first meeting, at Art Goldberg’s place, was naive and with no conception of the struggle we were entering. Nobody had any idea that this was going to last for very long. The University does not deserve a response of loyalty and allegiance from you. There is only one proper response to Berkeley from undergraduates: that you ORGANIZE AND SPLIT THIS CAMPUS WIDE OPEN! . . .
"Go to the top. Make your demands to the Regents. If they refuse to give you an audience: start a program of agitation, petitioning, rallies, etc., in which the final resort will be CIVIL DISOBEDIENCE. In the long run, there is the possibility that you will find it necessary to perform civil disobedience at a couple of major University public ceremonies . . ."
The Ad Hoc Committee to End Discrimination -- led by former Berkeley student and Slate founder Michael Myerson and by Tracy Sims, leader of the Palace Hotel demonstrations -- announced plans to picket the Oakland Tribune for the third Friday in a row, and held a noon rally at the Bancroft and Telegraph entrance to the Berkeley campus. We are students-American students--who believe in the right and duty to hold, relate, and advocate positions and actions that reflect our desire to promote a continually improving world. 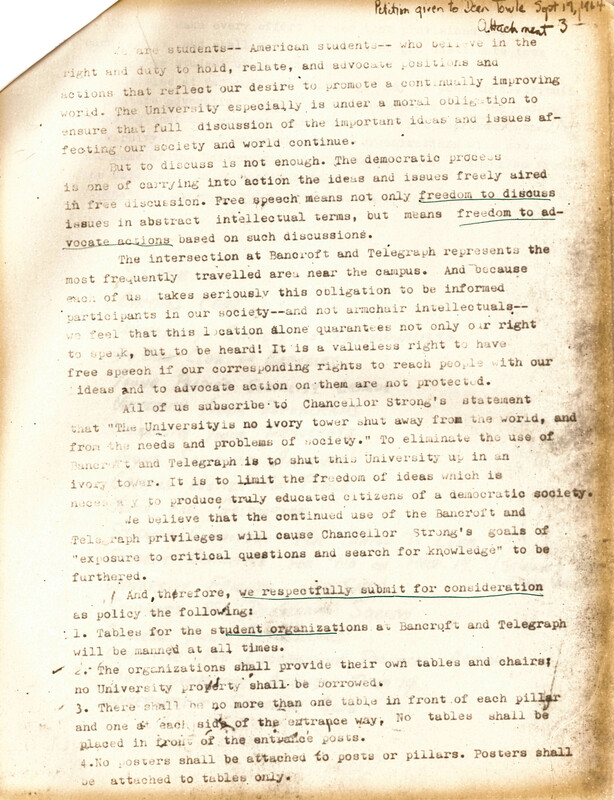 The University especially is under a moral obligation to insure that full discussions of the important ideas and issues affecting our society and world continue. But to discuss is not enough. The democratic process is one of carrying into action the ideas and issues freely aired in free discussion. Free speech means not only freedom to discuss issues in abstract intellectual terms, but means freedom to advocate actions based on such discussion. The intersection at Bancroft and Telegraph represents the most frequently travelled area near the campus. And because each of us taken seriously this obligation to be informed participants in our society--and not armchair intellectuals--we feel that this location alone guarantees not only our right to speak, but to be heard! It is a valueless right to have free speech if our corresponding rights to reach people with our ideas and to advocate action on them are not protected. All of us subscribe to Chancellor Strong's statement that "The University is no ivory tower shut away from the world, and from the needs and problems of society." To eliminate the use of Bancroft and Telegraph is to shut this University up in an ivory tower. It is to limit the freedom of ideas which is necessary to produce truly educated citizens of a democratic society. We believe that the continued use of the Bancroft and Telegraph privileges will cause Chancellor Strong's goals of "exposure to critical questions and search for knowledge" to be furthered. 1. Tables for the student organizations at Bancroft and Telegraph will be named at all times. 2. The organizations shall provide their own tables and chairs; no University property shall be borrowed. 3. There shall be no more than one table in front of each pillar and one at each side of the entrance way. No tables shall be placed in front of the entrance posts. 4. No posters shall be attached to posts of pillars. Posters shall be attached to tables only. 5. We shall take every effort to see that provisions 1-4 are carried out and shall publish such rules and distribute them to the various student organizations. 6. The tables at Bancroft and Telegraph may be used to distribute literature advocating action on current issues with the understanding that the student organizations do not represent the University of California--thus these organizations will not use the name of the University and will disassociate themselves from the University as an institution. 7. Donations may be accepted at the tables.